The Pleasant Hearth Cahill Fireplace Door is a stunning fireplace door system that compliments many different types of decor. The antique brass finish adds style and class to any fireplace. Along with the doors, an insulation kit along with rigid mesh panels are included. The various available sizes fit a range of fireplaces and create a tight seal that ensures you have a safe and enjoyable fireplace. The classic design of the Pleasant Hearth Cahill Fireplace Door has an antique brass finish along with easy grip handles and an air damper control slide. These handles and slide are both finished in a similar style creating a classic look that is well suited for any type of home. 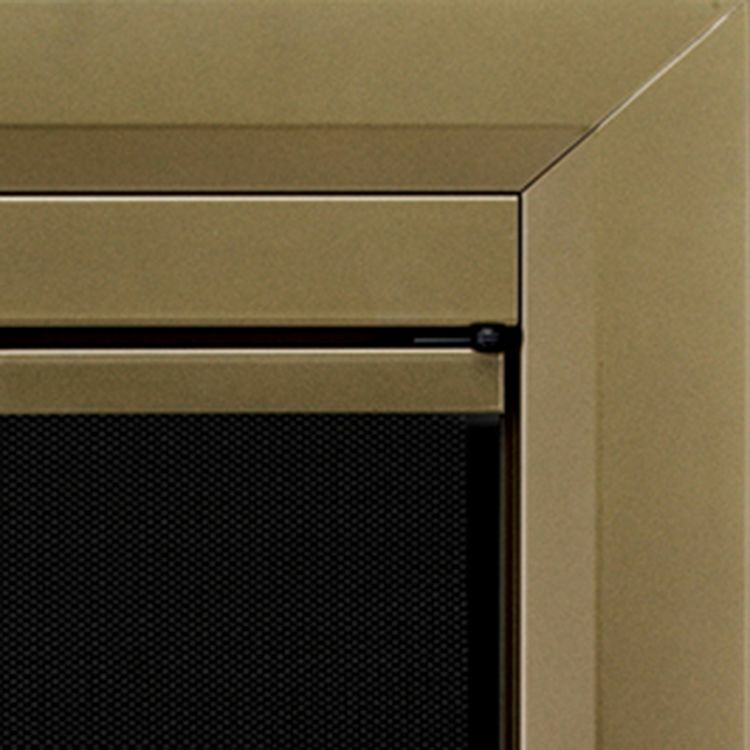 The glass on the cabinet-style doors is a smoked safety glass and the doors close with easy catch magnets. 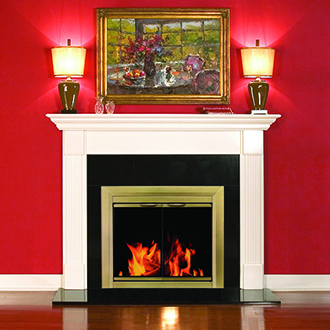 This fireplace comes in a range of sizes that fits fireplaces from 30″ to 43″ wide. These fireplaces are designed to reduce air conditioning and heat loss up the chimney but up to 90%. Compared to other companies, these are highly efficient and safe fireplaces that are well suited for any masonry fireplace. 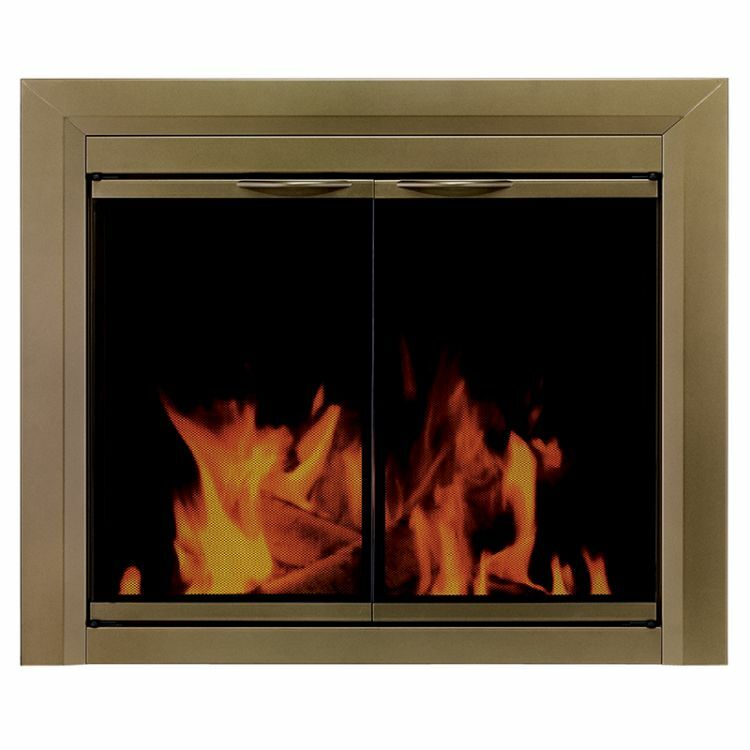 The frame of the fireplace is made of a highly durable heavy gauge steel and a 1-3/4″ beveled welded frame. Each of the variety of available sizes is designed to tightly seal in a range of fireplaces. Many different sizes available to suit any home. Class design that is suited for a range of styles from classic to modern. Proudly made in the United States with high-quality craftsmanship and materials. Additional insulation materials included with the fireplace. Reduce utility costs through tight sealing magnetic doors and easy to use to air damper slide. Might be quite heavy or difficult to install for a single individual, be sure to have assistance when moving and installing the fireplace. The smallest available size is 30″ which some people have found to be too large for their fireplaces. How tight the seal is? Most people have noticed a significant reduction in heat and air conditioning loss up the chimney as a result of installing this fireplace. The Pleasant Hearth Cahill Fireplace Door includes everything you would look for in a fireplace set including the handles, fireplace, sturdy frame, and additional insulation for sealing the fireplace. Overall, this fireplace is a tremendous value for what is included. The quality American made craftsmanship and solid steel construction ensure that the fireplace is high-quality and durable for many years to come. The design is classic and the brass finish is well done and complements the smoked glass very well. The safety features are also designed to meet industry standards and help to reduce utility costs for their customers. Compared to many other fireplaces on the market today, the Pleasant Hearth Cahill Fireplace Door is a tremendous value and a perfect fit for customers looking for a classic fireplace at a great price.